ASICS Australia has recently opened their largest factory outlet store to date with our team appointed to lead the project design from concept to delivery. Situated in South Wharf, Melbourne the store was formed from 5 existing units within The Direct Factory Outlet shopping centre consolidated into one, providing over 750sqm of retail and stockroom space. As the project design team, our scope of work included initial concept development and store schematics, 3D visualisation and completion of a coordinated technical drawing package for statutory approval and Contractor tender. During the site works, we assisted the Client in design management and coordination to ensure the project was delivered to reflect the desired intent. 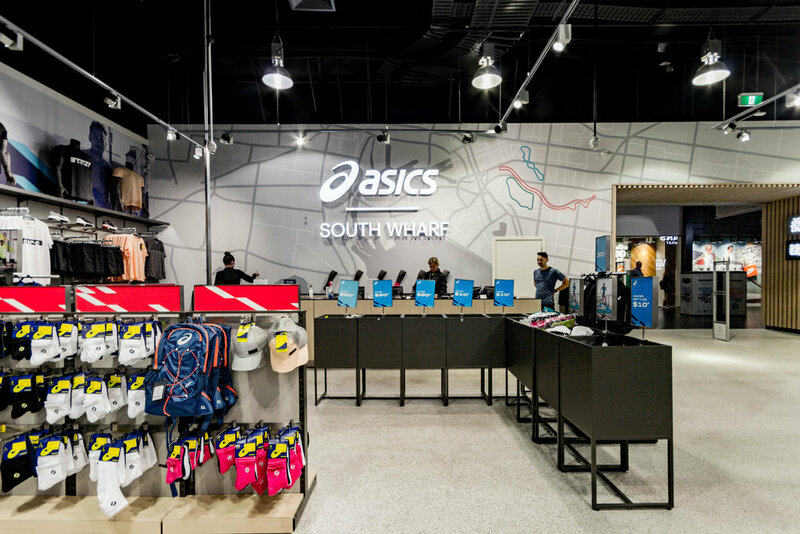 South Wharf is the first factory outlet that houses ASICS’ new concept. This represents a significant milestone in ASICS’ continual growth. 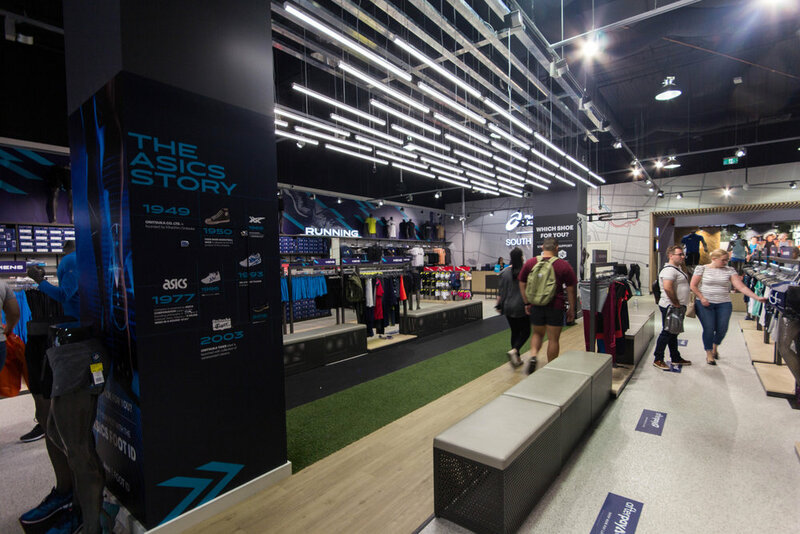 Using the core functionality of the current factory outlet fixture suite which is successfully utilised in over 200 ASICS FO stores globally, we were able to align the factory outlet concept with the full price retail environment. By applying a warmer finishes palette to both fixtures and store interior the store reflects ASICS’ current brand direction. In addition, our 2D team developed the in-store POS and environmental graphics by up-weighting product categorisation and integrating visually striking displays using ASICS’ brand photography – all of which feature in ASICS’ global graphic update. A key feature of the store design is the central test track area. This creates a customer focused hub and adds an experiential element to the customer journey. 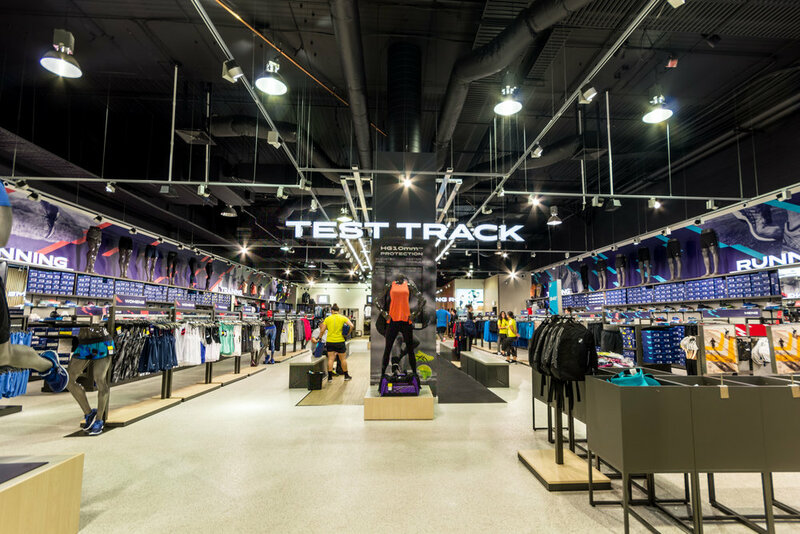 The test track consists of differing floor surfaces, enabling customers to try core sports footwear such as Netball and Football as well as running footwear. ASICS have always provided comprehensive footwear analysis for their runners so it is a natural progression that this service is now accessible to their core sport customers as well.